Brian Cody’s men will now face Offaly in the quarter-finals. TJ Reid was the star for the Cats. TJ REID FIRED 0-12 to spearhead Kilkenny’s third straight victory in Division 1A of the Allianz hurling league as they quelled hard-trying Wexford to secure qualification for the quarter-finals. The outcome pits Kilkenny against Offaly in the last eight, while Wexford will be home to defending Division 1 champions Galway. Already-qualified Wexford had the luxury of experimenting ahead of their more pivotal championship rematch at the same venue next June, whereas Kilkenny’s greater pursuit of victory on this occasion saw the inclusion of the injury-plagued Ger Aylward in his seasonal bow. The talismanic Reid fronted the Kilkenny charge as they built a 0-14 to 0-9 interval lead, and although the visitors roused themselves to close to within 0-21 to 0-17 on 63 minutes, the home side determinedly avoided a fourth straight defeat to Wexford. Indeed, Wexford ambitions of a first four-game winning run against the black-and-amber since 1956 were under threat from an early stage as Reid conjured a 0-4 to 0-1 gap after nine minutes for the more purposeful hosts. And defender Conor Firman prevented further damage when preventing Aylward from making the most of a defensive error. Paudie Foley’s accuracy from frees was crucial as Wexford closed to within 0-5 to 0-4 after 21 minutes, before Kilkenny appeared to be reasserting control when Richie Leahy, James Maher, Walter Walsh, John Donnelly and Aylward pushed them clear by 0-12 to 0-5 after 28 minutes. But Wexford gained cohesion for a spell to close to within 0-12 to 0-9 after 33 minutes as Paudie Foley, Rory O’Connor, Cathal Dunbar and Kevin Foley scored. Kilkenny hit back through Reid’s sixth personal score and midfielder Leahy’s third to claim a richly merited 0-14 to 0-9 interval advantage. Wexford resumed with greater purpose to shave the difference to 0-13 to 0-15 after 42 minutes as Diarmuid O’Keeffe and Conor McDonald obliged. But Kilkenny reimposed themselves through Maher and Reid to lead 0-21 to 0-15 after 58 minutes as Brian Cody’s men appeared to be cruising to victory. Wexford regained a semblance of hope though as Rory O’Connor posted four more times to have the margin down to 0-21 to 0-19 entering added-time. 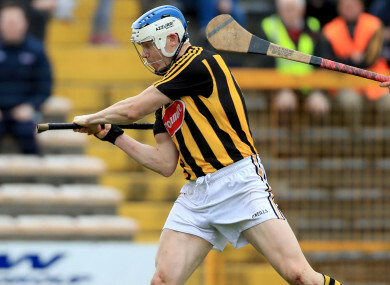 But as both sides fell short with late goal efforts, Walter Walsh sealed a merited success for Kilkenny to add to their growing momentum heading into the quarter-finals. Scorers for Kilkenny: TJ Reid 0-12 (0-10fs), Richie Leahy 0-3, James Maher 0-2, Walter Walsh 0-2, Ger Aylward 0-1, John Donnelly 0-1, Cillian Buckley 0-1. Scorers for Wexford: Pádraig Foley 0-6 (0-5fs), Rory O’Connor 0-6 (0-3fs, 1 ’65), Kevin Foley 0-3, Cathal Dunbar 0-2, Conor McDonald 0-1, Diarmuid O’Keeffe 0-1. Email “TJ Reid fires Kilkenny to crucial three-point win over Wexford ”. Feedback on “TJ Reid fires Kilkenny to crucial three-point win over Wexford ”.